← This is my “crazy in love” look. Pinterest is the latest social media heartthrob and one of the fastest growing sites in history. Pinterest allows you to “pin” your favorite photos and videos from across the Web and create curated collections called “Boards.” Bloggers, serial magazine photo clippers, stylists, and big brands are flocking to the site and pinning hundreds to thousands of photos each. I’m just getting started with Pinterest. On the other hand, my wife, Belén, has over 40 boards and 2,300 pins. 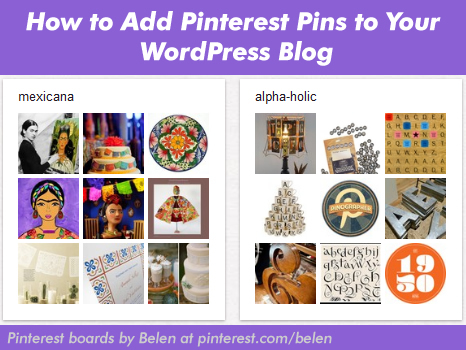 “Awesome, so how can I add Pinterest pins to my blog?” you may ask. But, the plugin only allows you to show recent pins from amongst all your boards. If you are an experienced WordPress designer and you’re cool with having pins from multiple boards then you can go ahead and install the “Pinterest RSS Widget” and move on with your life. If you want to learn how to add pins from a single Pinterest board then you should tune into my next blog post. For those of you who are new to adding plugins to your WordPress blog or for those who want to double check that you’re doing things correctly, you can follow along. Log into your custom WordPress install site. From the Dashboard, click on the “Plugins” link on the left toolbar. You’ll then see an “Add New” link. Click on that. After clicking the “Add New” link, you’ll see a search box in the main middle pane. Type in “Pinterest RSS Widget” and click on the “Search Plugins” button. The plugin was created by BKMacdaddy Designs. A search grid will appear and you will see the name of the plugin. Click on the “Install Now” link just below the name of the plugin. The plugin files will be copied over to your Web server and you’ll see a message that reads “Successfully installed the plugin…” on the “Installing Plugin” screen. Click on the “Activate Plugin” link. The Pinterst RSS Widget can now be added to your WordPress blog as you would add any other widget. From your Dashboard, click on the “Widgets” link under the “Appearance” section of your left side toolbar. Because you added the plugin to your site and also activated it, you will be able to see the Pinterest RSS Widget with the rest of the standard WordPress widgets. Drag the Pinterest RSS Widget to your sidebar. If your theme has multiple sidebars then you have to choose the one where you want it to appear. Configure the widget so that it looks best on your blog. You can set the Title that appears at the top of the widget section and specify the Pinterest username of the pins you want to show. You can put other people’s pins on your site if you had a reason to do so. You can also set the maximum number of pins to display, the height and width of each thumbnail, whether to display the pin’s title below each image, whether you want to open a new window if a user clicks on a pin thumbnail, and some nice options if you want to add a “Follow me on Pinterest” button to the bottom of the widget section. The image below shows the resulting sidebar widget that would appear on my blog if I were to use my jesseluna Pinterest account. If you are OK with having different pins from different boards then you are done. But if you want to learn a method of showing recent pins from a single board then you should continue on to the follow up post. If this tutorial helped you get your Pinterest pins onto your site please leave your web URL below and let me know if you had to make any other modifications. This entry was posted in Communications, How To and tagged blog, boards, pins, Pinterest, Plugin, Sidebar, WordPress. Bookmark the permalink. This one works better than the next post for just boards. These links work great and the variables in size, etc. really help. I like the option to post a specific board. When you say “custom WordPress install site,” is that for a paid account? I would love to add my Pins but not sure how to get to the plugin store. Hi Elena, if you have a WordPress.com account, then you won’t be able to add any “plugins.” There are “widgets” that you can add to WordPress.com blogs but they don’t work the same way as a plugin. If you have your own website and have a WordPress blog on it (as you would if you had a Web host) then you would be able to add plugins. The Web post has more details on the different between the two types of WordPress sites: http://www.jesseluna.com/2010/04/26/the-difference-between-wordpress-com-and-wordpress-org-blogs/. Oh no! That was my question too. So there is no way for me to install Pinterest on my WordPress blog then? Just found a way to add Pinterest pins to WordPress.com sites. Add a “Flickr” widget to your sidebar then use RSS feed of your Pinterest board. You can obtain the RSS feed link but going to your board, like “http://pinterest.com/melanieminnaar/smart-design/” then adding “RSS” to the end. Use that link (http://pinterest.com/melanieminnaar/smart-design/rss) and add it to the Flickr widget. Unfortunately, there is no way to set the exact width on the images so it will either fit with your site’s design or it will not. Thanks for this detailed write-up. It’s really useful. I had the same query as Melanie and am following the steps you’ve outlined in your reply. Unfortunately, it seems this is only for any one board at a time and not your entire Pinterest content, right? A comment was accidentally deleted when my site went down last night so I’m going to re-post it. I’ve been trying to find a way to add my pinterest board to my blog for a while, I’m glad i found your site. Anyways after following the steps I created a feed through feed43, but when i displayed my pins there only showing up vertical and there really big. I was trying to have them display like yours. I went back, to see if I could modify the height, etc but it doesn’t give that option with my plugin. I’m currently using the Pinterest Pinboard Widget plugin on my right sidebar.